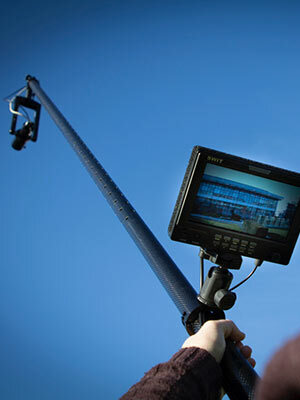 Polecam has been a major player in the crane market for nearly two decades and its rigs have captured everything from interesting perspectives of major sporting events to grand vistas in blockbuster movies. Spires Media recently had the opportunity to get our hands on one of these sophisticated pieces of kit ahead of doing some filming work for the marine biology department at Plymouth University. As experienced jib operators we were keen to check out the Polecam set up and so headed down to the company's vast warehouse in Bedfordshire. There's no getting around the fact that carrying all the elements required to create a 10 metre-long crane on location takes some muscle power, but thought has clearly gone into keeping the weight down. The extendable arm sections are made from carbon fibre and we were astonished by how easily they clipped together. As with everything, building the Polecam becomes quicker once the process has been gone through a number of times. There are a plethora of wires, which all need to be fed through the carbon fibre tubes and attached to the correct sockets at the other end. It takes a minute or so extra, but it's a neat and tidy solution for the cabling. The wires take a feed from the camera to the recorder monitor and also provide a link between the joystick and the motorised Polecam head. The final part of the set up is the addition of a 10 kilogram counter-weight. It takes a little practise to get to grips with the set up procedure, but having gone through it a number of times, we can now be up and running in around 15-20 minutes. Operating the Polecam is a simple one-person job. Becoming proficient takes a little longer, but within a few hours of practice we had mastered the basics. The key, as with any jib, is to watch the camera as much as the monitor to ensure that you don't crash the head into something. The best technique is to flit between looking at the screen and looking at the Polecam head. Panning and tilting the camera while independently moving the pole, in order to maintain focus on a specific object was remarkably fluid and easy and the motorised head was impressively fast and versatile. The specially designed Fishface submersible Toshiba camera, which we were being tutored on, is the size of an action cam. It's incredibly useful that you can control the iris or the focus from the operator position. It produces lovely images and it is hard wired so you don't get any electronic interference. We found that once set up the Polecam can be moved around relatively easily - as far as large cranes go - making it a useful tool for getting multiple angles on a shoot in a short space of time. Our package includes a harness to attach the pole to the body, which can be use when filming at unstable locations such as out at sea or when you want to achieve a spontaneous tracking shot on the run. Having got some nice results with our early testing we have now started to use it on shoots in London and other major UK cities where drone operation is not permitted. Our next stop is a trip down to sunny Devon to capture underwater shots of sea Bass off the south coast.